The equipped monster gains 300 ATK. 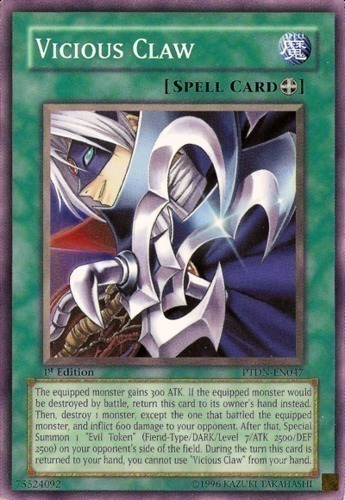 If the equipped monster would be destroyed by battle, return this card to its owner's hand instead. Then, destroy 1 monster, except the one that battled the equipped monster, and inflict 600 damage to your opponent. After that, Special Summon 1 "Evil Token" (Fiend-Type/DARK/Level 7/ATK 2500/DEF 2500) on your opponent's side of the field. During the turn this card is returned to your hand, you cannot use "Vicious Claw" from your hand.